Truthfully, I didn’t mind. 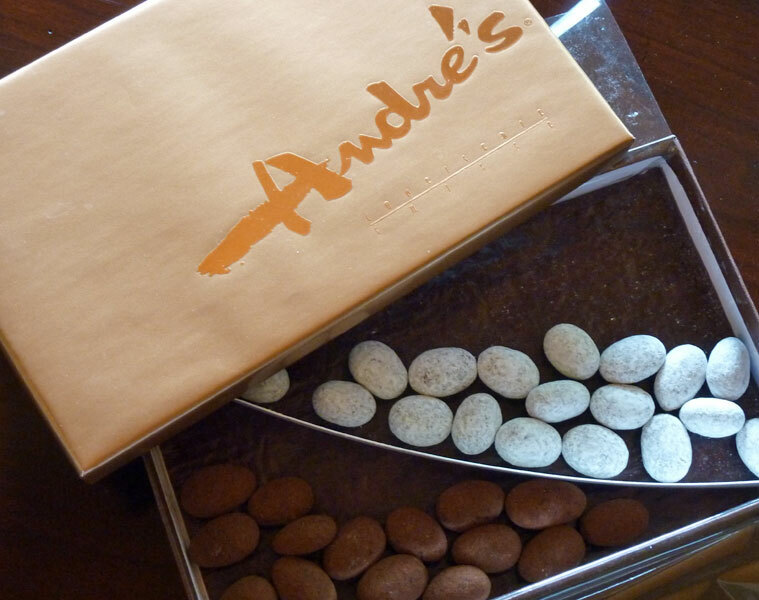 Andre’s award-winning chocolate covered almonds are a local favorite and an exquisite gift. The almonds are roasted to golden perfection and then delicately caramelized before they are dipped; you can get either creamy milk chocolate dusted with confectioner’s sugar or dark chocolate dusted with cocoa powder — or both! Many folks find Andre’s almonds downright addictive and would have torn through those nuts in record time, but not me. That beautiful gold-foiled box graced my countertop for nearly three months before I popped the last delightful morsel in my mouth. So what gives? It’s called willpower — and I’ve got it in spades! I owe it to my years working in a bakery. Gratification looks different when you’re surrounded by and have access to treats on the daily. You don’t acquire immunity to the aroma of fresh baked bread or warm fudge brownies, and you never get tired of them, but what you do get is an understanding that if you don’t indulge today, you’ll get your chance tomorrow or the next day or the day after that. Your mindset shifts and you just don’t feel that same urgency that so many people experience when they walk in and see trays of treats. When I left the bakery, I took that mindset with me. I’m picky in my indulgences. Donuts, store-bought baked goods and mass-produced chocolates hold no appeal — you can get those anytime, if you really want. But honestly, I don’t really want that. I hold out for the good stuff, and even then I often take a pass and wait for another day. There’s always another day. Even if you never get the chance to work in a bakery, you can increase your capacity for self-control. Studies have found that the more you flex your willpower muscles, the stronger they get. Not surprisingly, if you eat regularly and maintain blood-sugar levels you’ll have an easier time passing on a treat when you want to. Be realistic. You can delay gratification, but not forever. It’s not about following a diet, but more about using common sense; recognize a craving for what it is and tell yourself you’ll indulge next time. And if you want an extra boost to your will power, here’s some good news: People who exercise have better willpower when it comes to food then those who don’t.